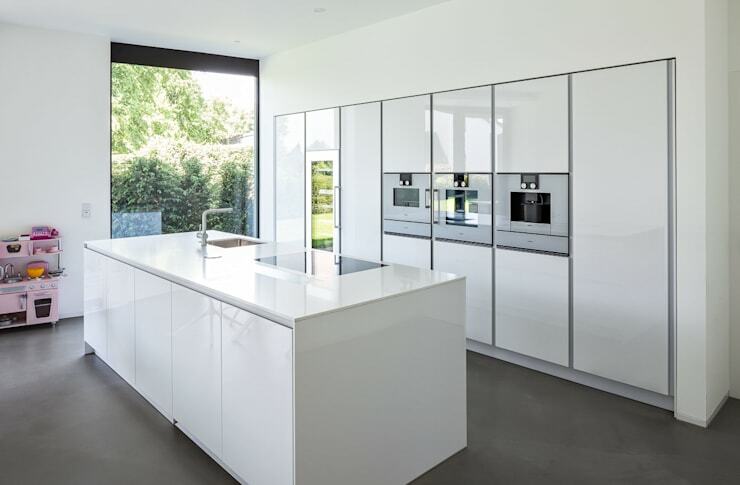 In this edition of homify 360, we visit a magnificent and stylish modern home! One with an elegant and structurally proud exterior along with a spacious and minimalist interior that is comfortable, trendy and simple. The beautiful home has been designed by the team at Zhac Studio and is an aesthetically pleasing family friendly house. The architectural design team along with the owners, value quality materials, stylish aesthetics and natural sunlight, something that has been included in the design from the strong exterior to the chic and sleek interior. The flat roof and large glazed windows does wonders to making this home comfortable, regardless of the weather or time of day! Let's get a closer view of this functional and practical home! 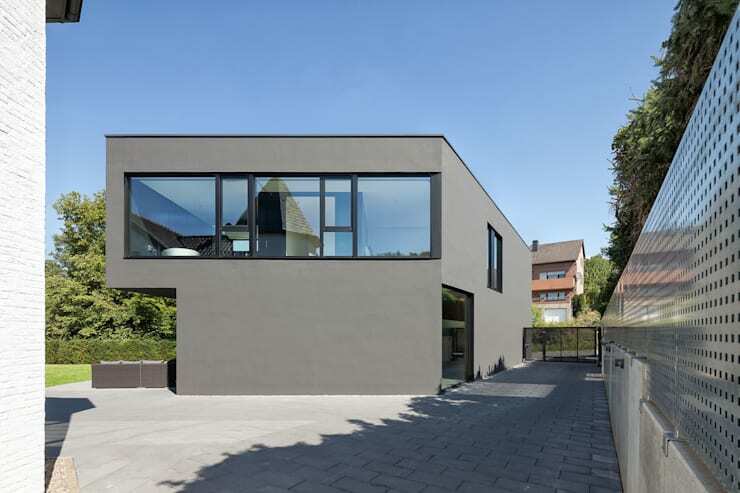 So while the front façade of this fabulous home opted to shield the residents from the street views and prying eyes, creating a private space, the back of the house seems to be a direct opposite. It's vast amount of windows and doors create a space that is well-lit, breezy and almost at one of the outside. Natural sunlight is an amazing way to enhance your home interior, making it more comfortable, brighter and cosier and this home has made use of it in abundance. So while the privacy of the residents has been maintained, the house is still at one with the great outdoors! Here we see a perfect example of how natural sunlight can create a comfortable home interior! This living room is without a doubt cosy and elegant. The neutral shades of grey and tan adds to the relaxing atmosphere, while the addition of a modern fireplace makes this living room even more stunning. The fireplace divides the living room from the dining room, while warming both rooms too! It's a chic and sophisticated atmosphere that we adore! The use of fantastic materials adds to the stylish charm of the room, wood, stone and concrete along with the leather sofas makes for a fantastic combination! 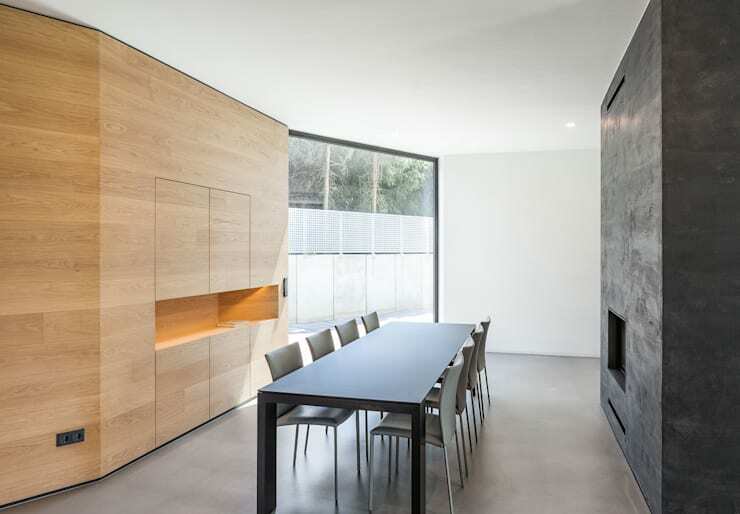 The large dining room area has an amazing amount of natural sunlight warming the space throughout the day, while extra storage is almost hidden in the wall too. It's minimalist, tasteful and modern design at its best! The neutral colours of wood, grey and white makes this dining room seem almost like a boardroom! The space is completely free from clutter of any kind, no ornaments, accessories or knick-knacks take up any space and instead the dining room is just coated in sunlight… it's rather refreshing! The fireplace will create a warm atmosphere, especially during those cold winter months, so cosiness in this home is not forgotten! This kitchen is spectacular. It has modern and sleek finishes of all-white walls, cabinets and appliances. It is extreme in its elegance and minimalist decor, but the simple countertop and centre island creates a work space that is functional and practical. 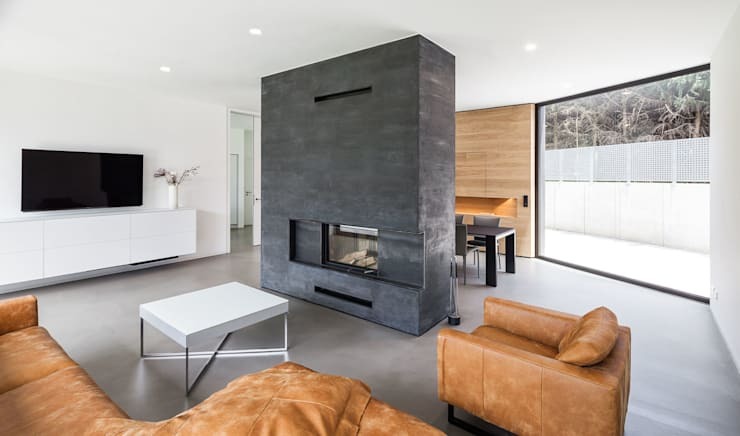 The contrast of the concrete floor creates an aesthetically pleasing environment, while the gorgeous glazing again communicates with the great outdoors, making it a fantastic part of the decor. If you need Fantastic Worktops for Your Modern Kitchen, then this Ideabook is just for you! 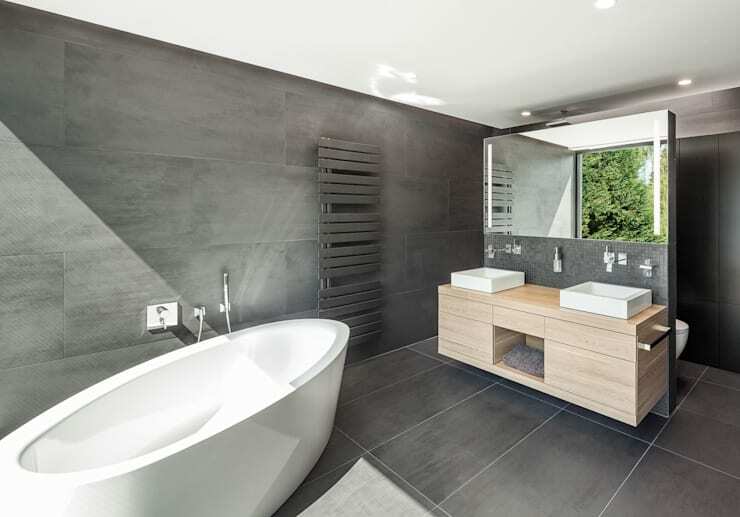 This private bathroom is in harmony with the rest of this beautiful home, the simple use of grey, white and wood is featured here too. The double sink and luxurious bath tub makes this couple bathroom the perfect place to unwind. The bathroom has a view of the backyard, maintaining that level of privacy, but also offering a great view of the greenery and lovely outdoors. It's a bathroom of refined sophistication and style, just spend the afternoon soaking up the sun in the bath tub and drift off in your imagination. This German home has everything that makes for great modern living, from the magnificent structure of this home to the idyllic setting, the simple elegance and sophistication of the interior that is drenched in natural sunlight, while maintaining the privacy of family time and of course a fantastic garden. The terrace has been integrated into the home, making it an extension of the living and social spaces. The residents can opt to enjoy the comfort of the great outdoors or opt for a cosy relaxing time inside, it all depends on the weather of course. Did you like this sleek and functional, uncluttered design? Do you have a favourite room? Let us know in the comments section!